This is a one to one model created as a reference for the final stone carving. 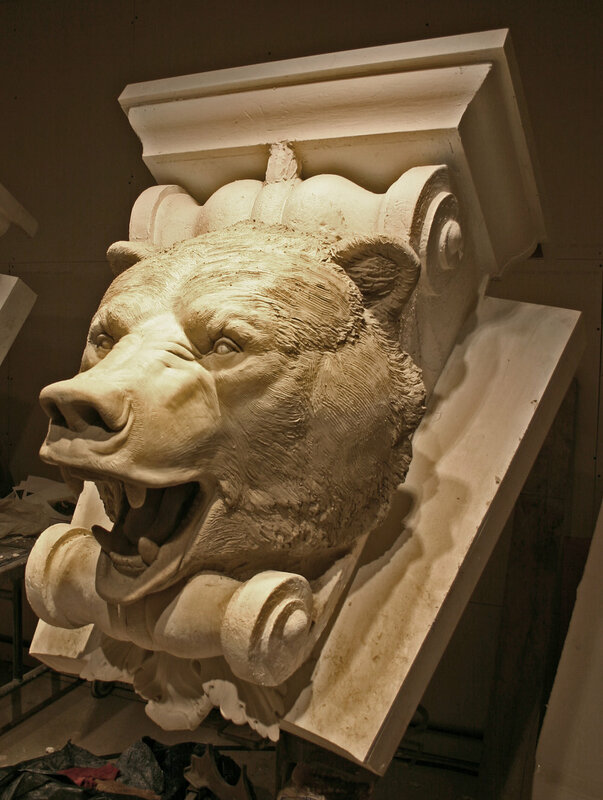 First an architectural background was created out of styrofoam and MDF, and on top of that I modeled a grizzly bear head out of water clay. Commissioned through Barre Sculpture Studios. Carved at Barre Sculpture Studios, this carving is a one to one copy of the clay model carved in Brazilian Gold Granite. 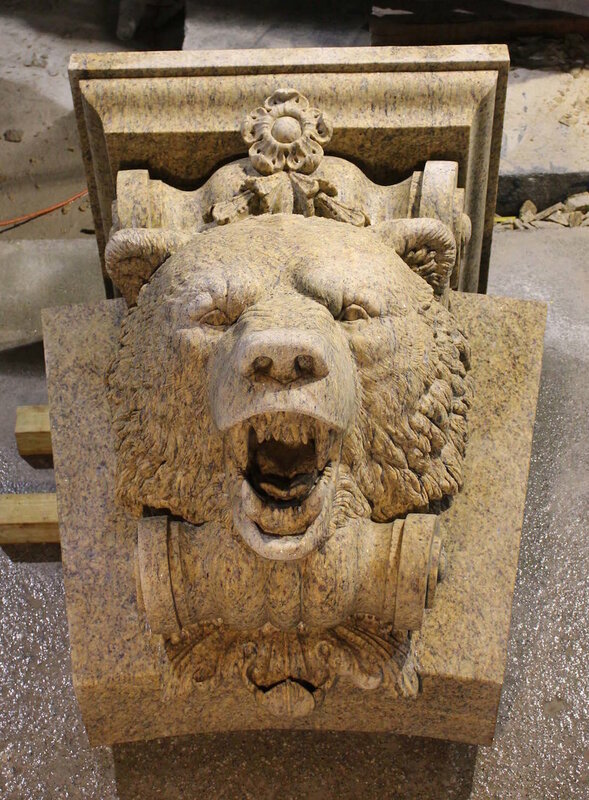 The final carving weighed between 2 - 3 tons and was mounted in the center of an arch with a 15ft radius at the Old Parkland campus in Dallas, TX. Commissioned through Barre Sculpture Studios. 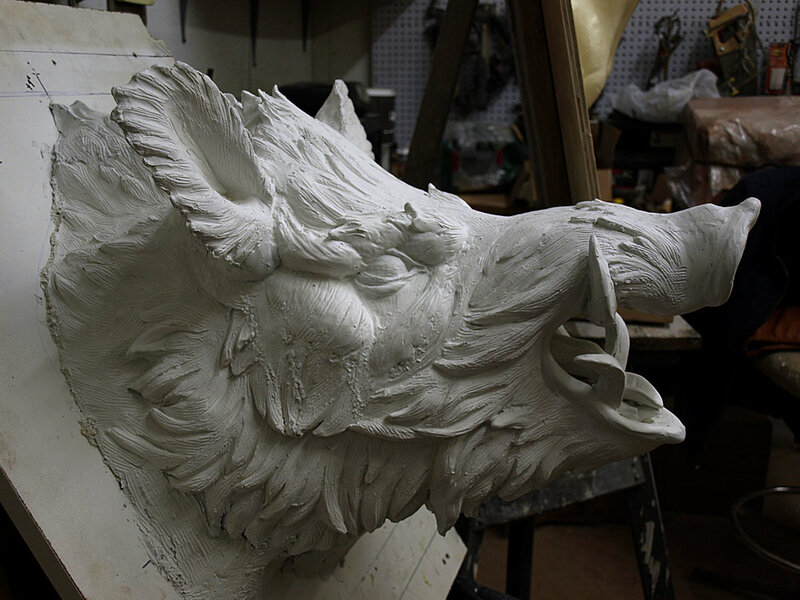 This is a life sized wild boar head sculpture. 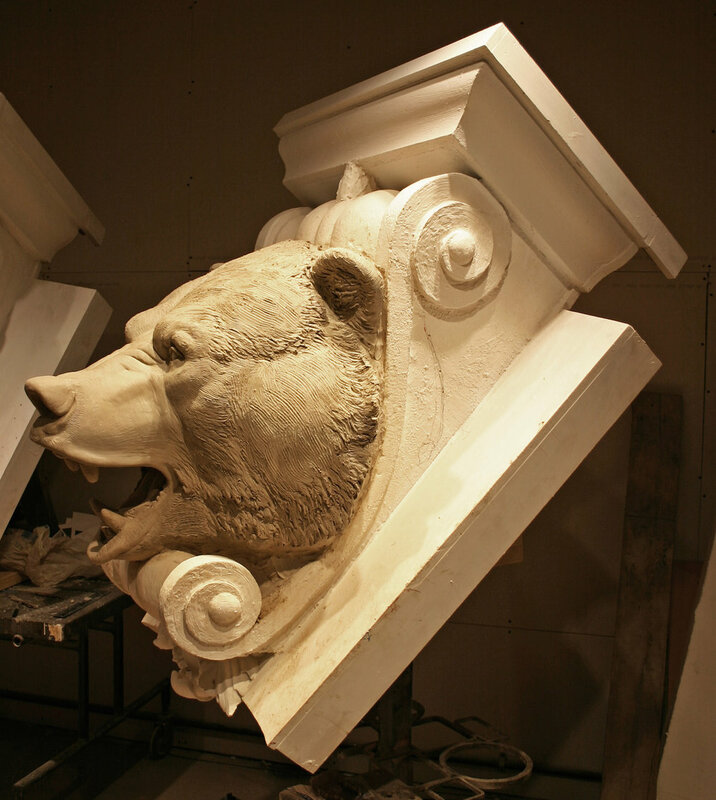 The model serves as a one to one reference for the final stone carving, and was cast using the Forton MG polymer plaster casting system. Commissioned through Barre Sculpture Studios. Carved at Barre Sculpture Studios, the final carving for the mounted boars head sculpture was done in South African Black Granite. South African Black Granite holds a lot of detail as a carving medium, but is harder than most granite as it is actually a diabase stone. Commissioned through Barre Sculpture Studios. Carved at Barre Sculpture Studios, this Barre Grey granite sleeping lamb is carved on top of monument with a rock pitch face, and scroll carved into the front. Commissioned through Barre Sculpture Studios. 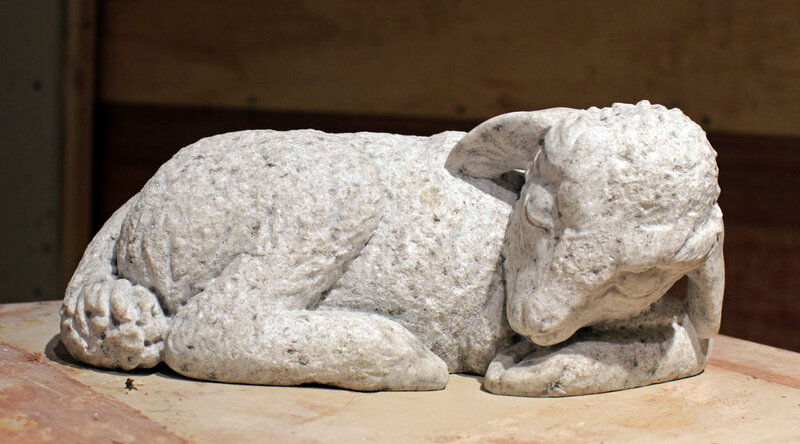 This sleeping lamb sculpture was carved in Bethel White granite for a client in Manchester, England. Carved at Barre Sculpture Studios, this Danby Marble bas relief of the praying Madonna was carved for a monument. Commissioned through Barre Sculpture Studios. This is a black granite marker with bronze inlay for my cousin in Berlin, Germany. The Labrys is an ancient double sided axe traditionally associated with female divinities for a monument. Commissioned through Barre Sculpture Studios. 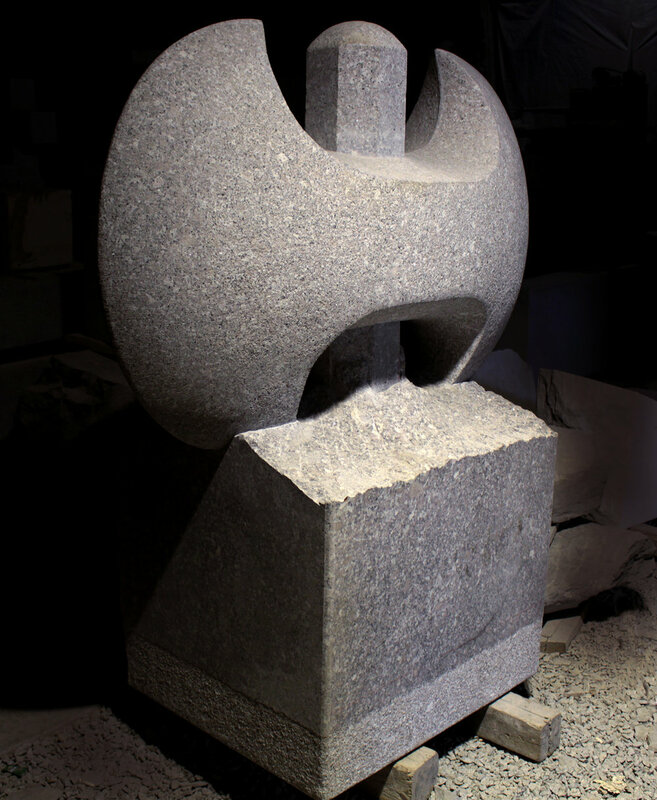 The Marble Abstract sail was carved out of Danby Imperial Marble, and stands over 5ft tall with a black granite base. Commissioned through Barre Sculpture Studios.